Companies are looking for qualified Master 100 Great Lake. Get you upgrade now to meet those needs. Needs to upgrade your credentials to Inland or Great Lakes Masters? Explorer's Guide Maritime Academy has the course to do just that. Our new Masters 100 ton Upgrade to Inland or Great Lakes Master 100 Ton's online is just 14 hours long with one 50-question exams. 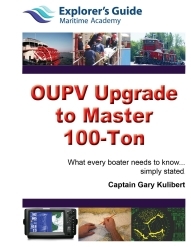 With this one weekend course your credentials can be upgrade to Master's 25, 50, or 100-ton which permits you to captain an inspected vessel depending on your sea service. Tonnage on your credentials depends on sea service. 100 Ton required 180 days on a vessel over 34 gross tons or 90 days on a vessel over 51 gross tons gets you a 100 ton license. Fee:$335 includes course materials, instruction, one sitting of the one final proctored exam, and Certificate of Completion. Locations: Online classes for this Masters 100 ton Great lakes are were ever you are.